This is the first post in a 2 part series. 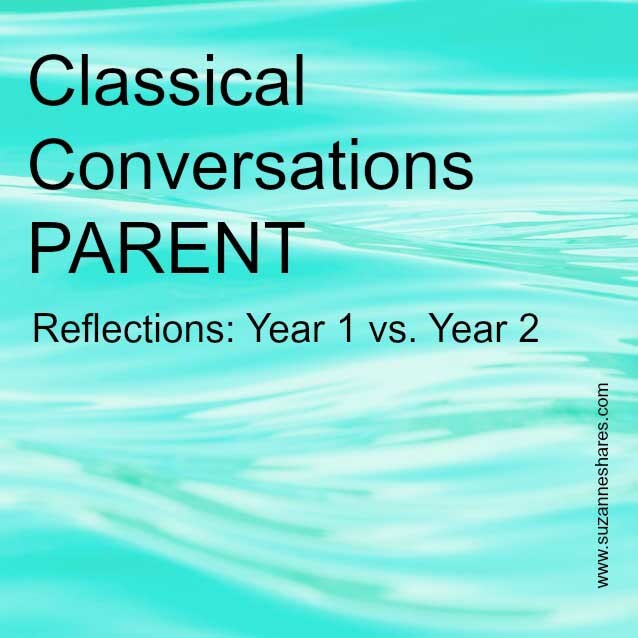 Read the second post, “Classical Conversations TUTOR Reflections: Year 1 vs. Year 2” here. Our Classical Conversations Community had a Mom’s Night Out this past week, and many of the women present have just joined CC. Their families will be starting in a Foundations class this fall. Many of the “newbies” asked questions that I asked 365 days prior. Our first year of Foundations was the first year of our community; 99% of the moms in our community were also “newbies.” I didn’t have many “seasoned” CC Moms that I could talk with and ask my litany of questions. So, I did as any homeschooling mom would do! I jumped in and navigated our first year of Foundations to the best of my ability. For my family there were a few successes our first year; this led us to sign up for a second year of CC. However, there were many, many choices that I made, which I never wanted to replicate. The consequences of those decisions my first year left me in a state of complete and utter burnout. I took the summer “off” in between year 1 and year 2 recognizing that I was burned out. I was in such a state of physical and mental exhaustion that, honestly, I was not completely “back to normal” when we started our 2nd year of CC four months later. However, God was so gracious! He sustained me, restored me physically and mentally, and led us down a drastically different path for year 2 of CC. Our second year finished about three weeks ago, and I can summarize it with these words: joyous, exhilarating, and FUN! Because year 1 and year 2 ended in such different ways, I have spent the past several weeks reflecting on why. I decided to put my reflections down on paper so that I can re-read them later in the summer and throughout the months of our family’s third year of Classical Conversations. I hope and pray they will be encouraging to those of you preparing to start CC for the first time. I think it’s safe to say that you can not implement what you do not know. So, if this is your first year of Classical Conversations, drink deeply from all 24 weeks. Yes, you may feel like you are drinking from a fire hydrant, but take lots of deep breaths along the way as you immerse yourself in CC. The other beautiful component of Classical Conversations is repetition. Even though our first year was treacherous and exhausting, I knew that we would do CC again the following school year and most likely three years later when Cycle 1 rolled around again! If you have “gaps” in your Classical Conversations learning your first year and plan to do CC in the future, know that those gaps aren’t permanent. They can be filled in during your subsequent years. Your depth of wisdom, insight, and understanding will increase with each year (and with each week of CC your first year, for that matter!). So, take a deep breath and repeat after me, “I will let my first year of Classical Conversations wash over me.” There! You feel better already, right?!!? 2) Seek To Understand the Classical Model. I have a confession to make. We just finished our second year of Classical Conversations, and this is the first year that I’ve made it my aim to do an in-depth study of the classical model. I am just finishing Echo in Celebration (FREE download) and The Core both written by Classical Conversations founder Leigh Bortins. My first piece of advice for a new CC mom is “Let your first year of Classical Conversations wash over you.” My second piece of advice is to read Echo in Celebration and The Core. These books will give you a breadth of understanding regarding the classical model and why CC is created and mapped out in its particular way. On a personal note, I felt “freed up” after reading both of these books. Many of the expectations that I was placing on myself as a home school mom and my children, my students, were obliterated after reading these books. Also, if you have already purchased your Foundations Guide know that it is a wealth of knowledge at your fingertips! Make it your task this summer to read pages 8-40 in the Foundations Guide. The logic and reasoning behind the structure of Classical Conversations is presented, which may prevent many “Why does CC do it this way?” questions your first year. Another question that I am always asked regarding CC is, “What curriculum do I need to buy?” If this is your question, read, “The Classical Model at Home” article on pages 31- 37 of the Foundations Guide. Leigh Bortins. Her encouragement is: “1) a rigorous language arts program that progresses with your child’s ability, 2) a complete math program, 3) memorization to train the mind, and 4) lots of reading, writing, discussing and relating centered around the best God has to offer” (page 32-33). I also loved the simplicity of her encouragement to “remember to focus on language arts and math until your child is an excellent reader” (page 33), which is the place where I am currently with my sons. Isn’t that wonderfully liberating?!?!? Leigh Bortins also shares how her family breaks down their school day into 4, one hour segments. The discussion begins on page 33. This 4, one hour segment approach was eye opening and invaluable to my family this past year. I plotted our 4, one hour segments over the summer in preparation for the 2013-14 school year. We followed the 4 segment approach this school year, and it was glorious! I especially loved how the 4, one hour segment approach served as a “budget” for me regarding what curriculum we did or did not use this year. If a curriculum did not fit into one of the 4 segments, I omitted it. I am notorious for having too much to accomplish in a day or a school year. The 4 segments aided me in trimming the “fat” from my curriculum list and focusing on the essentials that my sons needed. The curriculum that I had already purchased to use for the 2013-14 school year prior to reading the article (like Apologia Astronomy!) I was forced to shelve. I decided that we’d go through the additional pieces during our non-CC weeks or during the summer. 3) No, You DO NOT Have To Read A Book About Every New Grammar Fact Your Child Memorizes. At our Mom’s Night Out this past week, one of the mom’s asked me, “Do you just go to the library and pick out books related to what your kids learn in CC that week?” My first answer was an emphatic, “NO.” Follow the lead of your child. If he/she wants more information about a piece of New Grammar, he/she will ask you. When they want to know more about a History Statement or an event on the Timeline Card, look on the back of the respective Timeline Card and read it to them. If he/she is curious about this week’s Science question, read the “Science Snippet” for that week that is accessible on CC Connected or the CC App. Or, sometimes a one word answer will do. Son: Mommy, who was Franklin D. Roosevelt? Me: He was one of the Presidents of the United States. It is okay to check out books at the library about the week’s New Grammar. Don’t get me wrong! Just know that a successful Foundations year is not based on your child’s ability to explain each piece of New Grammar in dissertation-like form. One tool that we used in year 2 that we did not use in year 1 is a Classical Notebook. I learned about a Classical Notebook from Half A Hundred Acre Wood’s article last summer. The Classical Notebook serves as a means of built-in review for the week’s New Grammar as well as handwriting practice, and it is an independent activity that my sons can accomplish. All of these reasons had me “sold” on the idea of a Classical Notebook before ever using it! I made documents for our Classical Notebook over the summer, and off we set on this new adventure. Our CC school year is over now, and I am happy to announce that the Classical Notebooks were fabulous! After only a couple of weeks, my sons were in the routine of doing their Classical Notebook each day. Their favorite days were Wednesdays and Thursdays because they got to illustrate a Timeline card and the History statement. I enjoyed watching them flourish with independent work. Also, I loved knowing that they were reviewing New Grammar while also cultivating discipline and self-control; the Classical Notebook required them to sit for an extended period of time at our school table. (Now, my boys can always use extra practice with that!) We will definitely use a Classical Notebook again for year 3 of our CC adventure! The beautiful addition of CC to our home school has allowed me to give myself grace in the midst of self-doubt. I can look self-doubt and guilt in the face and scream, “YES, they are learning; they are learning a lot!” After 2 years of CC, I am flabbergasted at the quantity of information that my sons have learned! (This includes my 4 year old, who has yet to be in a formal CC class but has learned as much as his brothers through our review time at home!) If I accomplish nothing in a school day except reviewing the CC New Grammar, I have done a lot! This is helping hammer the memory pegs of the New Grammar even further into their little brains. If your child only remembers the New Grammar from any given cycle, he/she will still be ahead of the curve! So, if you are having a challenging home school day, give yourself grace! Take a few moments to review the New Grammar and then, go spend the rest of the day at the park! Rest in knowing that your kiddos are learning more than you realize! Enjoy your first year (or 2nd, 3rd, or 4th) of Classical Conversations! Enjoy learning with your children and finding God in all things! Here’s another post from the archives that offers encouragement to those of you beginning Classical Conversations! Really enjoying this series! We are still years away from this but I need all the time I can get to prepare. I am feeling more and more certain that CC is what my family will use when the time comes but the entire idea of homeschool overwhelms me. I’m thankful to know especially about those two books that I can go on and read now! Hopefully training myself early will help me not feel so overwhelmed when it’s time to actually start. Also I’d love to hear your thoughts on how to do homeschool with your oldest while you have two younger who aren’t yet ready. Would love to chat more off line sometime! Well done, Suzanne! Thanks for taking the time to not only encourage new CC parents, but to also remind “seasoned” people to keep it simple. Yes, friend! Keep it simple! Remind me of this when August rolls around!!! Yes, we should definitely chat!!! When John Martin was doing K, William did alot of things with us (particularly when we would read together). It was easy to include him because he wanted to do what John Martin wanted to do. 🙂 He wanted to be a “big” kid. Joseph was just a wee infant, so we did a lot of it while he napped. PLUS, for K, it honestly doesn’t take long! We just did math, handwriting and phonics (teaching him to read)…and then we did fun activities and read lots and lots and lots of books!!! These are such great pieces of wisdom! I can’t wait to share these with my community as a F/E Director. I feel like after 2 years of CC I was still learning the classical model. Now after our 3rd year of CC & becoming a new director I finally learned to focus on the new grammar. Brandy’s article on this is excellent. I feel like it was a huge success. We really struggle as moms to just “keep it simple silly!” I have had a child in Challenge these three years and she just graduated as a Challenge 2 student. She is well prepared for college and life in that she seeks God more diligently and loves to learn in all areas more then her then her sister prior to her. She is is my third to graduate after homeschooling all the way thru. I have three more to go! 🙂 This year I have seen everything we learned in Cycle 2 fleshed out in depth in a Challenge 2. They will have ample opportunity to add to their memory work in the years to come. I cringe when I see new mamas of 4,5 or 6 years old worried and stressed over what to add to CC. I give the same advice to focus on reading and math. If they learn to read well and love to read they can learn anything. The more we force learning the less they want to learn. Have fun mamas! Love to learn with your children. RELAX! And KEEP IT SIMPLE MAMAS!!! :). It goes all to fast and you will wish you could have those years back you spent stressing to love and enjoy your children more. I LOVE THIS COMMENT!!! I think I’m going to repost it in another article if that’s okay with you! I love reading about how CC worked so beautifully and well with your daughter in Challenge. That is so encouraging to hear that the years of New Grammar investment pay off as they enter the Challenge years. THANK YOU for sharing your wisdom!! SO SO thankful for it! God bless! Certainly! I’m very excited to see how much more this unfolds as my younger three head into Challenge in the years to come. We are keeping our son, who is Challenge A age, in F/E one more year to build a strong foundation and prepare him for the challenge years. It will be well worth going against the norm and “waiting” to ensure his success and enjoyment of Challenge! I have heard of others doing that (keeping them in F/E one more year), even a couple of families in our community. I think that is so so so so wise! I know it will make the transition from Foundations to Challenge smooth. Thank you, again, for sharing your wisdom as a Challenge parent. that makes me even more encouraged to keep drilling, drilling, drilling during these Grammar years. 🙂 God bless! Thank you for this well-thought out, meaningful post. Perfect. I’m sharing it with our campus here in Michigan! This is such great advice Becky! I LOVE IT! Yes, I need to remind myself to “let CC wash over me” again this next year for our 3rd year. Great wisdom!!! You should definitely look into the Classcial Notebook. Definitely read this post from HAHW about her Classical Notebook. It’s what sold me on trying it! Mine was a little different from hers, and you can incorporate other components suited to your child’s needs. It was a wonderful addition to our homeschool this year. I love that it is preparing my sons to work independently in the future. Praying God’s blessings on your family today as you prepare for next year! Thank you for this – it’s wonderful. We’re starting CC (and homeschooling) in the fall for the first time with 4th and 2nd graders. I’m already overwhelmed, but I will try, try, try not to overdo it. Thanks for the reminder that we can’t possibly do it all – and shouldn’t try! I pray that you have a GREAT year with your kiddos next year as you embark on your homeschooling/CC journey! It is easy to feel overwhelmed when you start homeschooling! I remember that feeling very well (and still have to battle it at times!) Find some seasoned homeschooling moms in your new community and pick their brains. 🙂 Find out what curricula they recommend, their greatest “nuggets” of wisdom for you starting out, and PRAY a lot! 🙂 The great thing about this journey is that you’re not (and never will be!) alone! 🙂 He is with you, and I pray that your new community surrounds you and encourages you with this transition, too! 🙂 God bless! Thank you, Suzanne, for such a great reflection. I am thankful that after the first 6 weeks of this year, I finally heeded your advice and stopped trying to put CC into my box mentality. What a freeing 3/4 of a year we just completed. The fall starts our 2nd year – as you know. I am so thankful for our awesome community and the CC model. I love the “wash over” you idea. I hope it’s not just the first year that we can do that as I want year 2 to “wash over” me as well. I am looking forward to the new doors God is opening to our family through CC. Thank you for always sharing things so plainly and clearly. I appreciate you! Yes, I think it is TOTALLY fine to let CC wash over your in year 2, year 3, year 4, and beyond. Another lady commented on the post and recommended not just letting it wash over you in Year 1. I needed to hear that from her and hadn’t thought about it that way. So, yes, I’ll be right there with you letting it wash over me this next year too. So thankful that you joined CC this year and that you’ve come into my life! 🙂 Much love!! Thank you, Suzanne. I feel the same about you and your sweet family. Great days to come. I am looking forward to learning much from you. an me from YOU, too! Thank you so much for such a well written, encouraging article. I could literally feel myself relaxing as I read it 🙂 It is such a wonderful confirmation of the real purpose behind a classical education. I have been praying about changing to the 4, one-hour segment approach. I feel The Lord has been telling me to “simplify, simply” and enjoy every moment with these sweet little boys. I was wondering, do you happen to have an article that describes your typical day, or your homeschool schedule in more detail? I’m just curious. I love reading everything you write, and seeing how it all looks is so helpful to me. Have a wonderful and blessed summer with your boys! I am so humbled to hear that you felt yourself relaxing as you read the article. SO SO HUMBLED! I wrote it all down in hopes that it would be encouraging and help others not repeat my mistakes. So, seriously, I’m so so humbled! Thank you for sharing!! No, I don’t have anything written down about the 4, one hour segments, but I really need to do that. Several have asked about that. I would HIGHLY recommend reading what Leigh wrote about it in the Foundations guide. The page numbers are included in the blog post. She explains what hers looked like, and I modeled ours after that. I am SO glad i had a chance to read this! This year will start our first year with classical conversations and I look forward to learning how to teach my child classically. He is only five and absolutely loves ‘doing school’, like it’s a game, as he puts it. It encourages me that he sees it as a fun environment and not a burden. I have seen already how our attitudes can either make or break a fun day if shool and I pray For many fun days to come! We are both extremely excited about our journey to classical conversations! I’m so excited to hear this was helpful for you Rachel! SERIOUSLY, take the first year and let CC wash over you! Your son is 5, so he will do Cycle 3 probably two more times! Just enjoy learning with your son and letting the Classical Model soak in throughout the year! Enjoy, enjoy, enjoy your first CC year!!! God bless!!! I’m really glad I clicked through to your post from the CC carnival at Homegrown Learners! We were in Foundations during the 2012-2013 school year (and I tutored AND had a baby! ), and I could’ve written your post about being burned out, stressed, etc. In fact, my stress and burnout led me to take a year off from CC, but we’re seriously considering re-joining for the new school year. These are great tips! Hi Suzanne, Thank you so much for this post, it was incredibly helpful for me! I’m starting CC with my 5 year old this year. I’m looking forward to it and want to thank you so much for the warning and for sharing your experience of burnout and how to avoid it. I do have a question for you. I’ve heard people say that for 5 year olds you don’t need a notebook and I’ve heard some say that a notebook is helpful. Can you tell me how you think it’s helpful and how it helps you to keep things simple as you mentioned above?